One time I recommended that a friend try adding ginger to her smoothies. She's obsessed and chalks up her amazing energy, her sense of wellbeing and high immunity to the ginger in her smoothies. And she's probably not wrong. 1. Digestion is perhaps what comes to mind when most people think of ginger (gingerale when you're sick, anyone?). Ginger can help alleviate nausea so it's great for anyone with a stomach bug, morning sickness or undergoing chemo. It can also help with indigestion since it speeds up the rate at which the stomach empties food into the intestines. 2. Gingerol is the main anti-inflammatory compound in ginger that gives it so many of its health benefits. Consuming ginger regularly can help with muscle soreness from working out, pain and stiffness associated with osteoarthritis, and cramps in women during their period. 3. Ginger can help lower LDL cholesterol and also help lower fasting blood sugar, both of which are factors that contribute to heart disease. 4. Because ginger can inhibit the growth of many different kinds of bacteria, it's great for protecting yourself from colds and other germs. It might also be effective against viruses. 5. The antioxidants and anti-inflammatory effects can positively affect our bodies in a variety of ways - including Alzheimer's and cancer prevention. Pretty amazing, isn't it!? 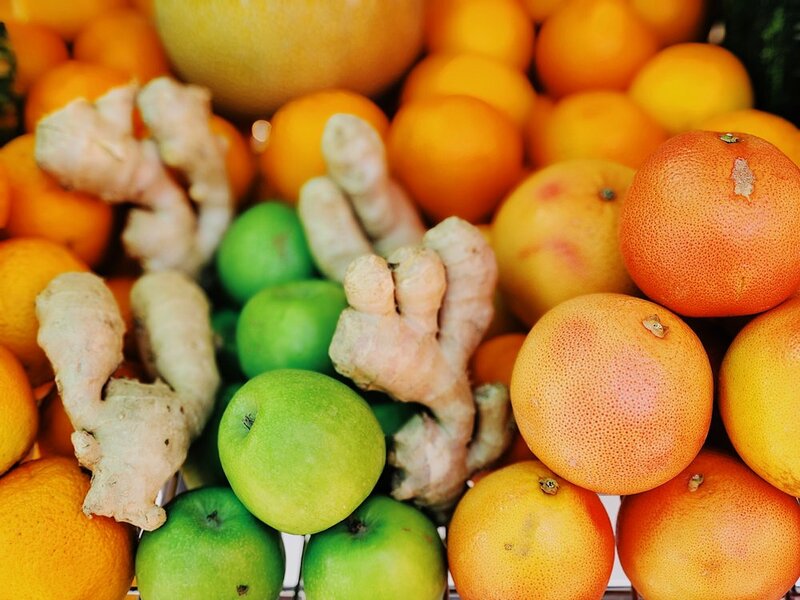 So go load up on ginger and if you're feeling really bold - try drinking ginger juice straight up! Nothing makes me feel more bright-eyed and alive. Other ways to incorporate ginger into your everyday: ginger tea, add a little knob to smoothies, grate over veggies, eat a thin slice or two before meals, make or choose juices with ginger in them, make a sauce with grated ginger.